Professor Greg Hannon is to become the next Director of the Cancer Research UK Cambridge Institute. Cancer Research UK and the University of Cambridge are pleased to announce the appointment of Professor Greg Hannon as the new director of the Cancer Research UK Cambridge Institute. The Institute - one of the largest cancer research facilities in Europe - is based in the heart of the Cambridge Biomedical Campus. This close collaboration between scientific research and hospital brings huge benefits for the 6,000 cancer patients that pass through the doors of the hospital every year, as well as patients around the UK and the world. By focusing on the clinical application of high-quality basic research, the Institute forms a bridge between the laboratory and the clinic, and brings together leading scientists, doctors and nurses. The Institute’s landmark findings include the discovery that breast cancer can be divided up into 10 different diseases, paving way for new treatments, and it’s pioneering research into blood tests that could one day be used to understand the unique molecular profile of a person’s cancer. 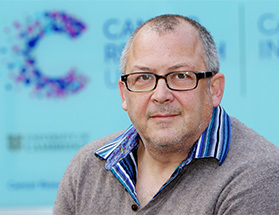 Professor Greg Hannon joined the Cancer Research UK Cambridge Institute in 2014 as a Senior Group Leader. This was after spending more than 20 years at Cold Spring Harbor Laboratory in New York, where he was a Howard Hughes Medical Institute Investigator and chaired the cancer genetics program as part of the Lab’s NCI-designated Cancer Center. Professor Hannon is internationally recognised for his contributions to small RNA biology, cancer biology, and mammalian genomics. He has a long history in the discovery of cancer genes, and he has developed widely used tools and strategies for manipulation of gene expression in mammalian cells and animals, and exome capture approaches that are now being used to inform personalized medicine in the clinic. Last year Professor Hannon was announced as one of the first ever winners of Cancer Research UK’s Grand Challenge awards. He and his team will receive up to £20 million for an innovative project to build a 3D tumour that can be studied using virtual reality and which shows every single different type of cell in the tumour. The technology will allow multiple doctors and scientists to look at a tumour at the same time, working together to help diagnose and treat patients better. On February 1 Professor Hannon takes over from Professor Simon Tavaré who has led the Cancer Research UK Cambridge Institute since 2013 and was a Senior Group Leader at the Institute since 2006. Professor Hannon said: “I’m incredibly honoured to be given this opportunity. I have Simon’s incredible legacy to build upon and the large responsibility to lead what is unquestionably a world-class institute into its next decade.